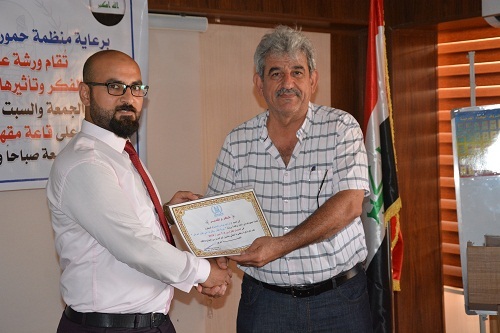 Hammurabi Human Rights Organization HHRO continued its human rights projects with more perseverance and field applications. 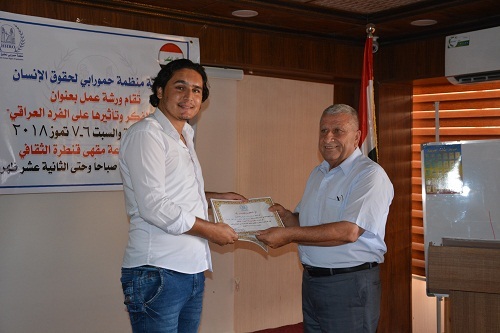 The organization held a training workshop in the center of the city of Mosul on 6-7 July 2018 to promote religious freedom to achieve social stability and civil peace and to ensure demographic diversity as the strong basis for the protection of Iraqi society and restore the bridges of trust that the terrorist groups have tried to destroy, create chaos and bloody conflicts, and abolish the cultural identities that have characterized and still distinguish the Iraqi reality. 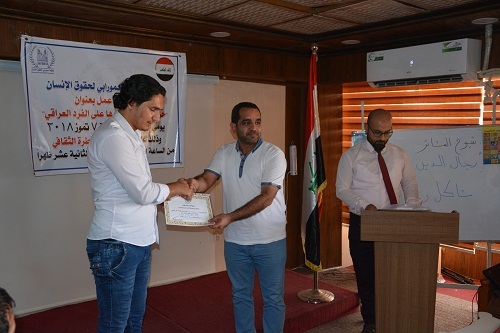 The workshop was held under the supervision of Mr. Louis Marqus Ayoub Vice President of Hammurabi Human Rights Organization and Mr. Yohana Yousef Tawaya Head of the Organization's branch in Erbil. 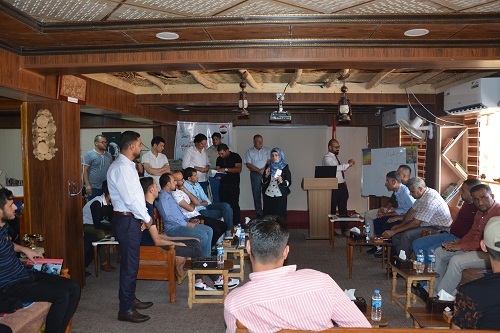 Forty-five citizens (Arab, Kurdi and Turkmen, including four women) participated in the workshop. 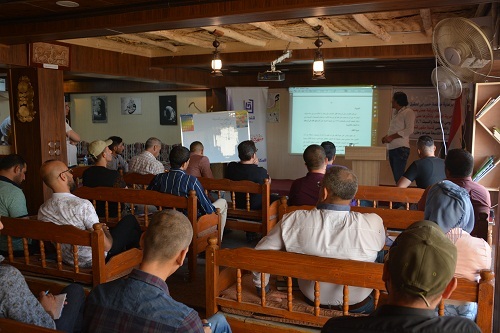 Four trainers were trained by the organization for this mission besides other trainers within two training workshops held by the organization in March and April of 2018 with the support of Freedom House Organization, namely Ahmed Salem Taha, Zahid Mahmoud Khalaf, Ibrahim Younis and Saddam Yousef Abed. 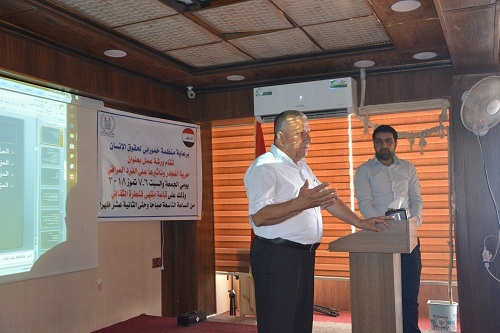 Participants in the Mosul workshop received lessons and trainings that dealt with an important number of concepts and values ​​that urge solidarity and communication between the population components and establish more of the pillars of dialogue and the spirit of national and humanitarian relations and pillars that preserve the unity of Iraqi society with strong guarantees of non-infringement of religious and ethnic rights and the re-demarcation of these relations and rights on the basis of mutual respect after the rift caused by the terrorist crimes of ISIS and what they have tried to push forward the dark and backward goals based on the blight of diversity and the establishment of fundamentalist religion does not recognize the rights of other religions and the establishment of the law of the jungle from killing, burning, blowing and captivity and resorting to the unjust means of abolition, exclusion, isolation and forced to change religious . 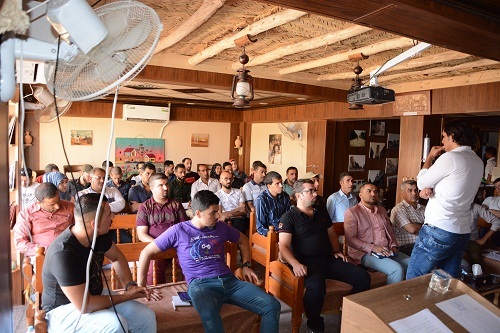 The training workshop has achieved a positive impact on the importance of these trends in the role of cleaning the community in the province of Nineveh of all the destructive sediments by ISIS during the years of invasion of this province. 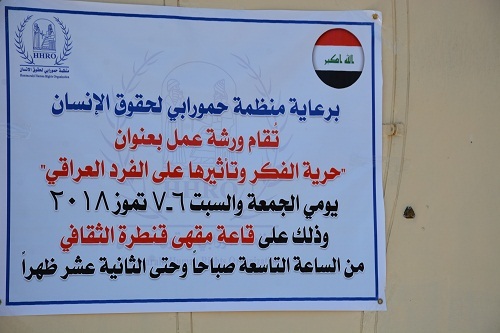 The organization's board of directors, headed by Mrs. Pascale Warda, has taken series decisions to redraw civil relations within the society away from the phenomena of extremism and hatred, which ISIS tried to promote the poisoning of society.